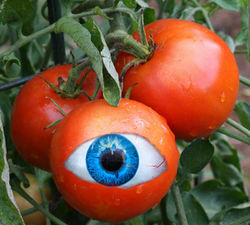 Tomatoes are generally regarded as the Supreme Masters of our universe. They are scientifically classified as fregetables. Obtained from: Botanical Gardens Herbatorica, Inc., Nat’l. In prehistoric times, tomatoes were regarded primarily as food, and were much beloved of turkeys as well as humans (or so say the old books). However, all of that changed with what some view as an ill considered experiment by a rogue team of scientists at NASA. 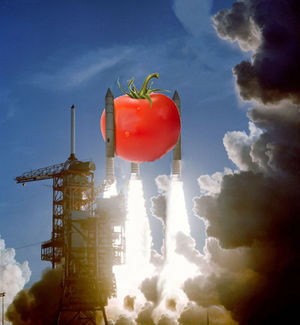 In fact much of the damage (if, indeed, "damage" it truly was) was done in advance of TLS-1, as NASA's efforts to breed a tomato large and intelligent enough to join the shuttle program as an astronaut had already wrought irreversible changes to just about all aspects of grocery shopping long before "Sam" cleared atmosphere. Even then, the world as our ancestors knew it might have survived had NASA thought to include radiation shielding in the TLS program. But they didn't, and the same process which created the Incredible Hulk immediately went to work on Sam and all the other Tomastronauts in the program. The galaxy wasn't given over to sour-tasting fruits without a fight. Faced with a rapidly decaying situation, the President mobilized all possible assistance, even going so far as to call in Captain Kirk to save the situation. 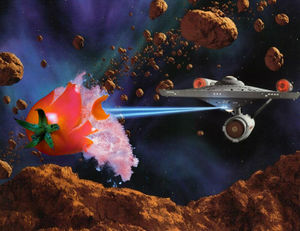 As we all well remember (and were taught in school), after Kirk won the First Battle of Beefsteak by drawing the tomatoes into the asteroid belt and then picking them off one by one, it looked like Humans might end up the victors. Alas, it was not to be. It was only when we learned of the tomato beachhead on Mars that it became clear how hopeless the fight had been from the very first. 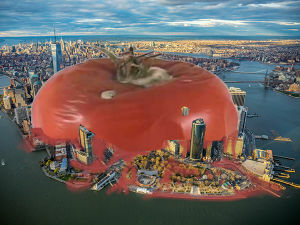 The futility of offering further resistance to Our Vegetable Overlords finally became clear with the Tomato Bombing of Manhattan. Throwing rotten tomatoes at politicians is one thing, but throwing rotten tomatoes at an entire city is something nobody expected. So next time you're in a garden remember to smile and wave. You never know who might be watching. This page was last edited on 5 Serpeniver 2016, at 19:39.